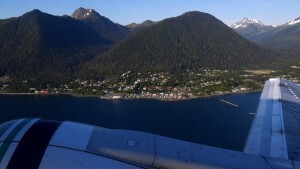 I arrived in Juneau, Alaska on May 22nd, having taken the “milk run” from Seattle that stopped along the way in two of my favorite Southeast Alaska towns, Ketchikan and Sitka. On the milk run from Seattle to Juneau, climbing out from Sitka. Most people prefer the direct flights from Seattle to their Alaska destination but I enjoy flying in and out of the small seaside towns, especially in beautiful weather such as we had. Waiting for me at the Juneau airport was my brother, Fred Sharpe, a preeminent southeast Alaska humpback whale scientist. Our original plan had been to leave the next day for Five Finger Lighthouse but it turned out our shipment of gear from Seattle on Alaska Marine Lines wasn’t arriving for another three days. I was actually glad to hear that. That would give us much needed extra time to prepare our vessel for departure, gather food, supplies and assemble an anchoring system for our fixed offshore hydrophone deployment. 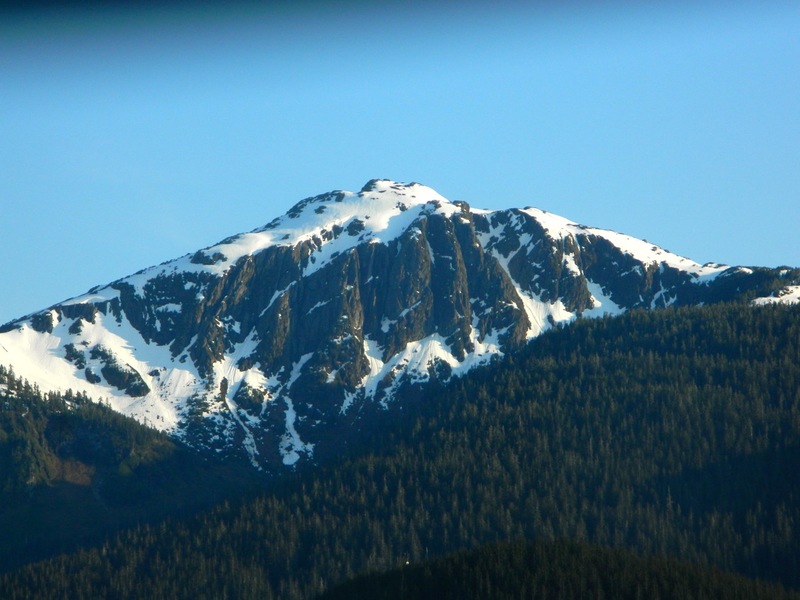 One of many scenic vistas, visible from Juneau, on a nice day. Juneau was stunning. I have been there several times and I’ve never seen it so clear and sunny. The capitol of Alaska, Juneau has two universities. This gives it a more progressive atmosphere than some of the other, more traditional towns. It also is a thriving cruise ship port that drops about a million passengers into the local community over the course of the summer. We were able to stay in Ed McIntosh and Jennifer Klein’s small apartment. 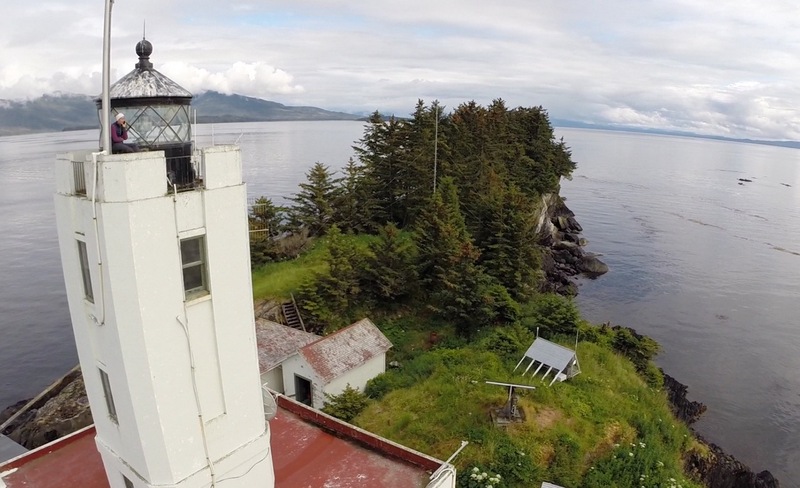 Ed and Jennifer are the primary board members of JLA, the Juneau Lighthouse Association, that oversees care of Five Finger Lighthouse. The pair have done a great deal of fundraising and physical labor on Five Finger Lighthouse over the past decade to bring it around to a habitable building. 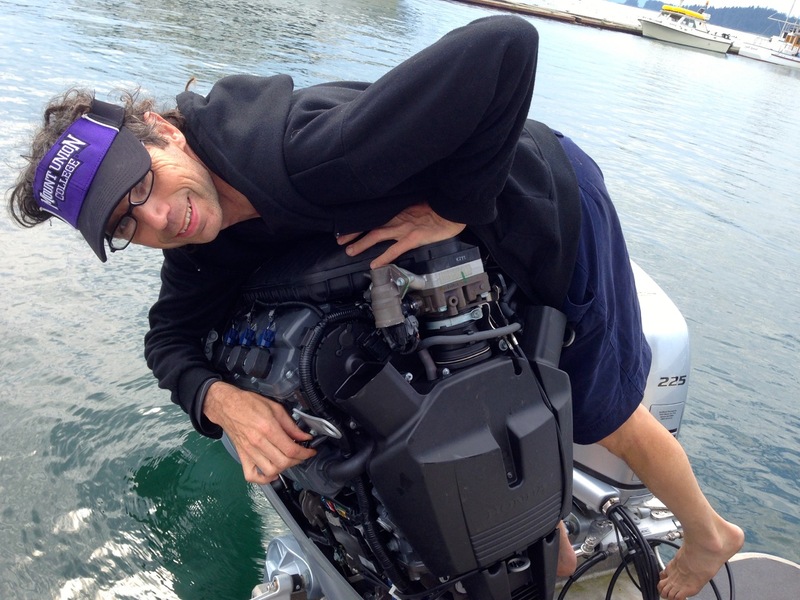 We had been working out in our heads what our hydrophone deployment system would look like. The water around Five Finger Lighthouse at the very least has strong currents every tidal cycle, flowing from the west every incoming (flood) tide and back to the east on an outgoing (ebb) tide. Add to that wind and waves and you have a challenging task to have a semi-permanent hydrophone in the water and not have it tangling with the anchor line or getting jerked around by the wave action. The anchor would stay in one location (hopefully) but the changes in current would mean the surface buoy could vary its position by as much as 100 yards in any direction. 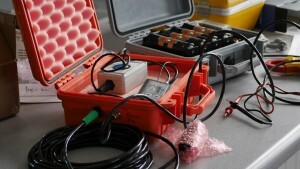 The hydrophone system is housed inside of two small pelican cases. 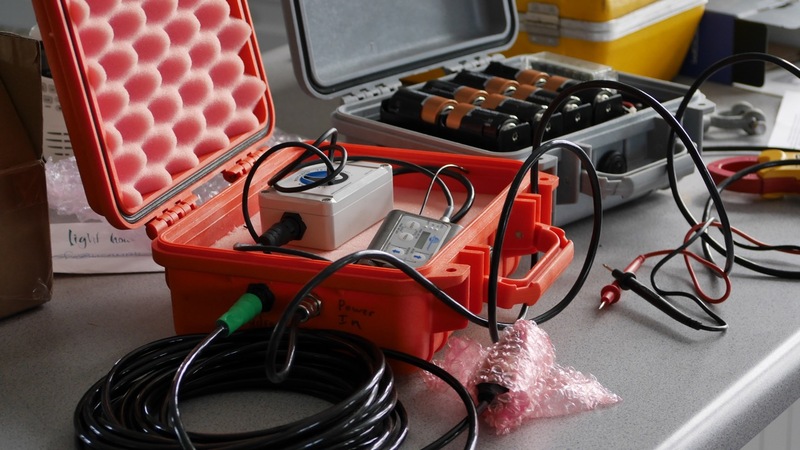 One case holds 16 D cell batteries, wired in parallel to give us long lasting power and the hydrophone pre-amp and wireless transmitter are in the other case. The hydrophone itself is on a ten-meter cable that will hang down into the water. It’s a prototype, we hope it’s going to work, but it’s been only tested briefly by it’s designer and builder, Joe Olson at Cetacean Research Technology. The pelican cases with our various cables running in and out of them are not waterproof, only water resistant. So the cases need to be housed inside of something else that floats on the surface. Originally Fred and Ed came up with the idea to use a large Pelican cooler to hold the smaller pelicans inside of it. But since the cooler is not designed to be a floating platform, the idea seemed tenuous at best. 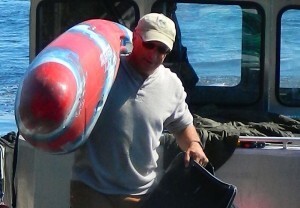 While we were in Juneau we came up with the idea to use a kayak as our surface container for the pelican cases. If we tied one end of the kayak to our surface buoy from the anchor line and ran the hydrophone off the other end, that would give us some nice separation between our anchor and hydrophone lines. I looked on Craigslist for a used whitewater kayak. I felt the wider profile and shorter length of a whitewater kayak would allow for more stability in the wind and waves. We found one for sale but the owner wanted too much money for our meager budget. Then we started asking around town for anyone else who might have a used whitewater kayak. It turned out Jay Donig had a kayak for sale. He was hoping to get some cash for it but when we told him what we were using it for and whom we were working with, he said we could have it; a generous contribution to our project. 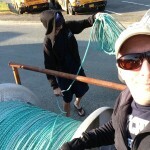 We still needed an anchor, chain, line and buoy for our deployment. 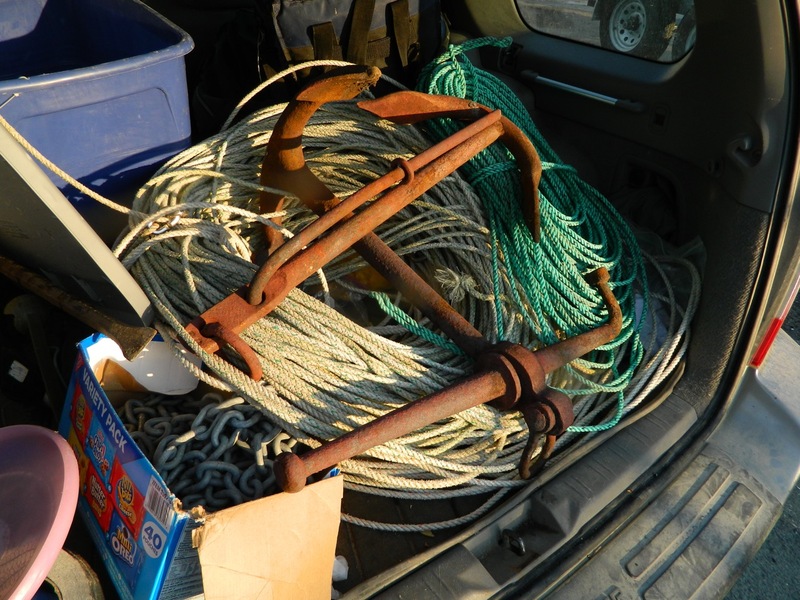 We ran into Dean — a good friend of Ed’s who showed us some old fishing gear we could scrounge from. 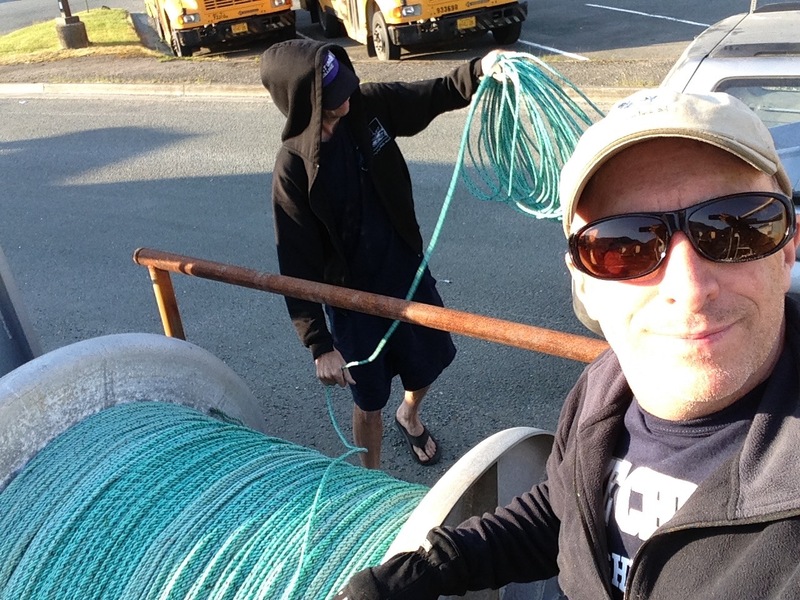 We found two old halibut fishing anchors, some chain and a large drum with old fishing line on it that we spooled close to 1,000 feet off of and hardly made a dent. We felt fortunate to be gathering needed materials without too much difficulty. After several days of running around, buying supplies, preparing the Connie K to leave the dock, and gathering raw materials for the hydrophone, we were ready to leave Juneau.